“They're under starter's orders... and they're off!” But this is no ordinary horse race. It's actually huge fun for kids and grown-ups, it's hilarious to watch and it's a great way to exercise into the bargain! In Pony Hop racing, contestants each sit astride their inflatable pony hopper on the start line. On the word “Go”, they bounce their way down the track to the finish line amid much cheering and laughter among the spectators – and there are some great photo-opportunities too. With a marshall/attendant provided as part of the hire, Pony Hop Horse Racing is a superb way to bring your guests together at a family fun day, corporate event, school fete, guide or scout camp, or team building event. 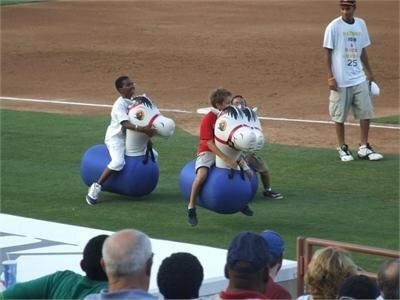 Or how about hiring it as an attraction at a real-life horse racing event? $480 for 3 hours hire including supervision.